The Niagara SkyWheel gives amazing views on Niagara Falls during day and night. 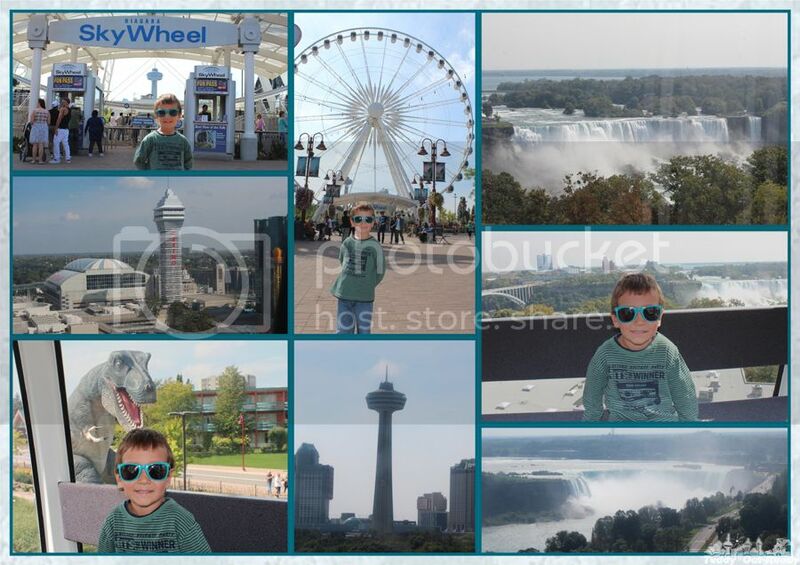 The weather was fantastic, we could clearly see the Falls, Niagara River, Skylon Tower and the surrounding area. Blue sky and sunshine made the views even more spectacular. The gondolas are very comfortable inside plus they are fully adjustable to any seasonal changes which make them perfect to ride during hot summer and cold winter days. The ride takes about 8-10 minutes and we switched from one side to another pointing to the different Niagara landmarks. 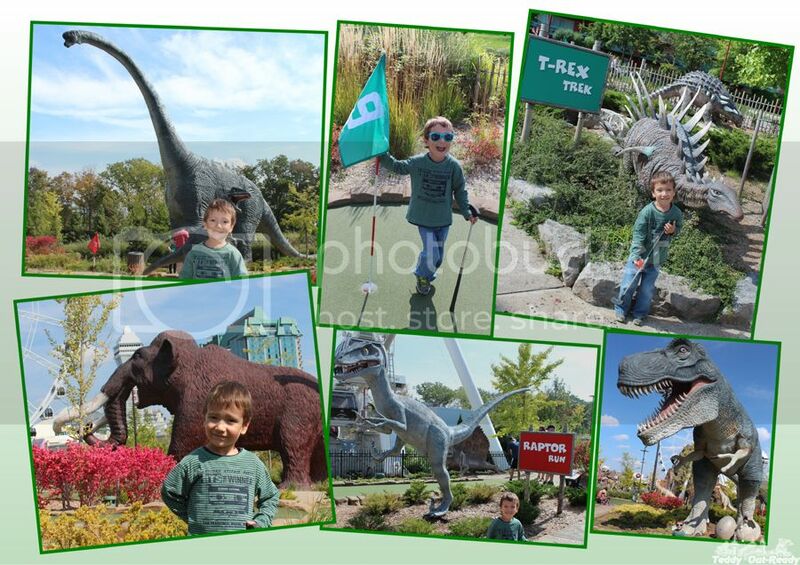 Next to The Niagara SkyWheel you can find another Clifton Hill attraction Dinosaur Adventure Golf which we decided to choose thanks to nice weather outside. Dinosaur Adventure Golf is a huge playing area with gigantic dinosaurs, ponds and an erupting volcano which Teddy was so excited about. There are different levels of this mini-golf course split by color offered. Since we have a little kid, we took the easiest path to make sure Teddy can play with us. XD Theater, Ghostblasters Dark Ride and the Great Canadian Midway are located close to each other in one complex. 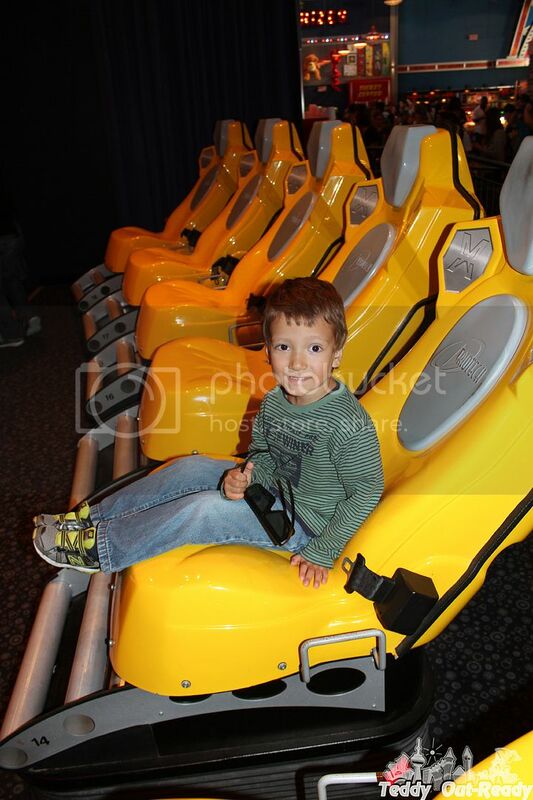 XD Theater offers 6D motion spaceship traveller ride combining visual, motion and lightning effects along with wind and wild shakes. Teddy at the beginning was scared to sit in the theatre’s special seat alone but when the movie started was so much into it and later said that he liked it. We had a fantastic experience and one moment I even forgot that I am at the theatre and watching a movie. It was like a real space adventure. Ghostblasters Dark Ride is a Halloween-themed 3D ride in a haunted house with all kinds of ghosts and skeletons. There are some scary moments for sure with falling on you blocks and a coffin, or phantoms approaching you. It is good that there is a laser gun to get rid of all the scary creatures and feel safe. 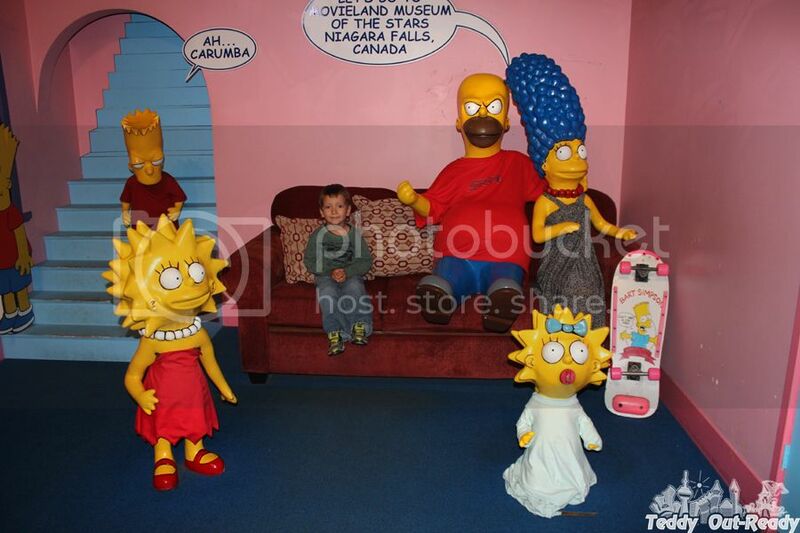 Movieland Wax Museum of Stars introduces a nice selection of wax version of celebrities from Katy Perry to Simpsons, Terminator and stars of Catching Fire. We were walking through and recognizing favorite characters. It was fantastic to watch some figures look absolutely identical to the real movie characters. We like the reproduction of well-known movies scenes like Lara Croft and Star Wars. Most of scenes are accompanied with music and sound effects. For the rest of our Clifton Hill trip we spent some time at Great Canadian Midway pavilion featuring over 300 entertaining games for kids and adults. We had a good time there jumping, driving and playing. Teddy’s favorites were riding cars and bikes, shooting in an old-fashioned tavern and hitting in a Hammer game similar the one, Candace plays from Phineas and Ferb series. 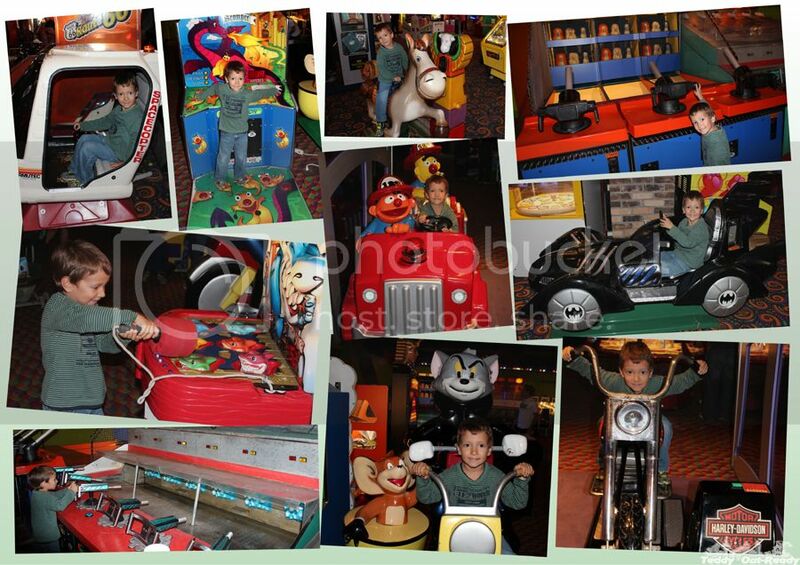 Overall, we had a fun day at Clifton Hill, enjoying lots of family- friendly activities. For more information of how you can spend your days at Clifton Hill please find them on-line, on Facebook and Twitter. With upcoming holiday season there are definitely lots of things to do there. We also very excited to offer our readers to win a set of three Clifton Hill's Fun Passes. The giveaway is open to Canadian residents only and ends October 18, 2014. My son would love the Skywheel. I think I would opt for simething closer to the ground, like Wizard Golf or Dinosaur golf!! 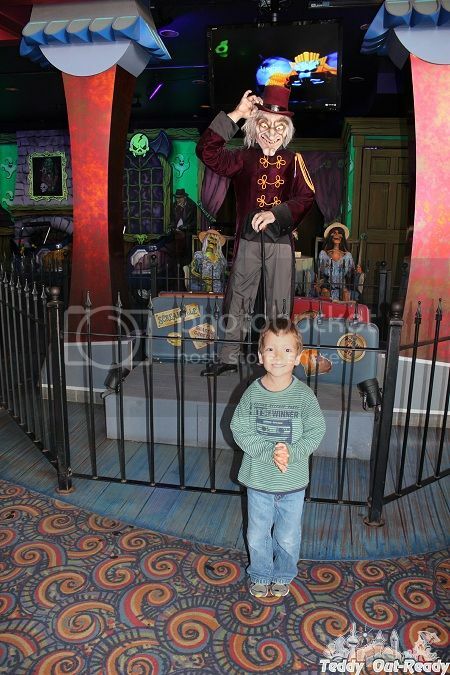 We would love to visit the Movieland wax museum, never been there before. Looks great ! The Skywheel is my fav! The SkyWheel! I have never been on it! I am most excited to check out the "Dinosaur Adventure Golf". Hope it is not too cold to do some outdoor mini putt! Would love a ride on The Niagara SkyWheel. We're going to Niagara in July 2015 for a second honeymoon. I'd love to see the SkyWheel at night. P.S. Your instagram link (in teh RC form) isn't working for me. I'm sure I follow you anyways (journeysofthezoo). 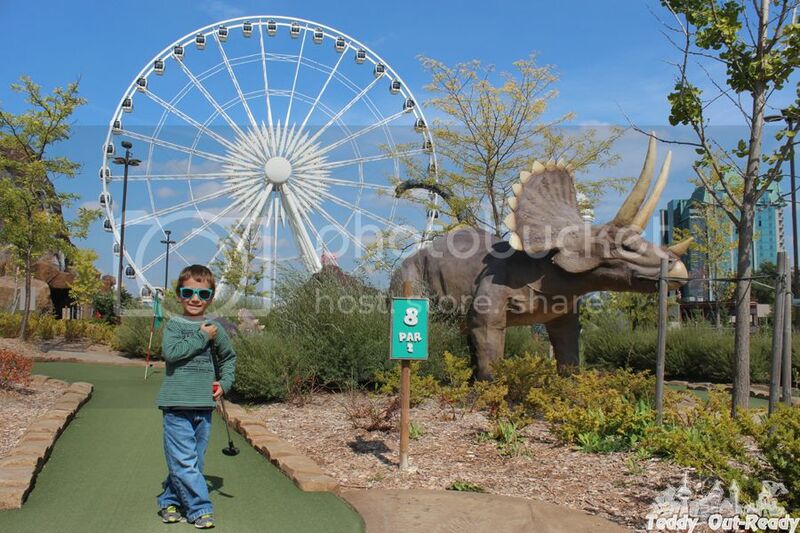 We love the Dinosaur golf. My son loves when the flames come out of volcano! Would love to go on the sky wheel! I really love the Dinosaur Mini putt. Last time I went my son was petrified to go throught the volcano, so we had to skip those 2 holes. Beautiful natural and man-made places on the famous Hornblower Cruise and even in the beautiful city of Niagara-on-the-Lake.